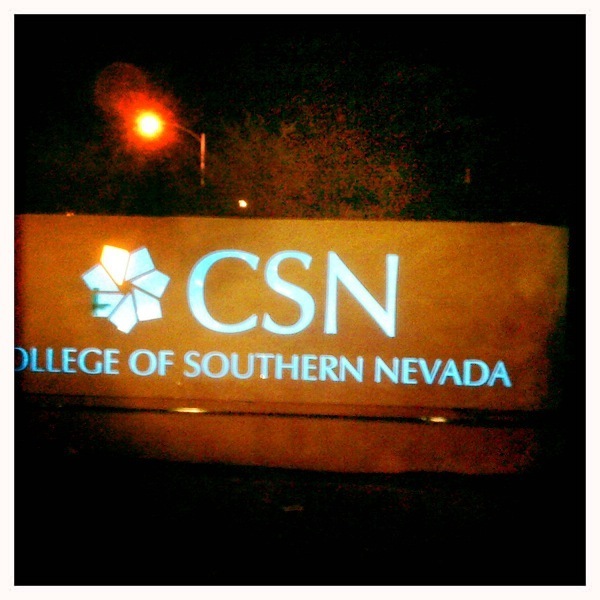 Entry sign outside of CSN's Cheyenne Campus. -Just a post on a personal note this morning. 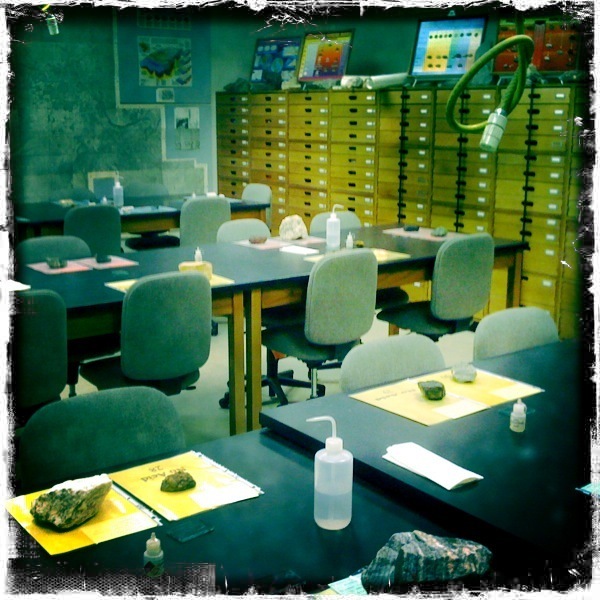 I’ve been filling in as a part-time geology lab instructor at the College of Southern Nevada for the past two years. Now, with a few semesters behind me, I find myself pleasantly surprised by what I (admittedly) was interested in as more of a resume-booster than as a potential career. While I love the stimulation of technical work and the satisfaction of fieldwork, (hence my day job,) I have to admit that I’m finding that teaching provides something unique: a sense of deep fulfillment. You never get to see an expression of understanding wash over an inoperative computer program’s face when you explain something to it in a new way. You don’t receive a sense of genuine appreciation from data when you fully invest yourself in taking scientific measurements. In contrast, the interaction between students and an instructor (at least in my experience so far) is very, very rewarding. Lab practical midterm setup before the students arrived. 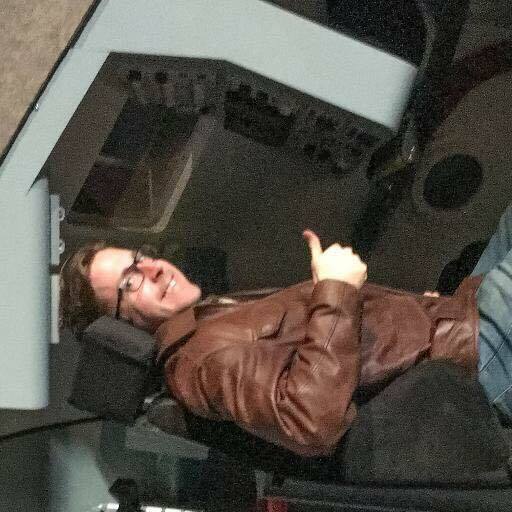 Quite frankly, despite the fact that I currently work 10-hour days out of town, and it’s an hour drive (dash) before the three-hour lab after work, I always feel better after teaching a class than I did before I arrived. Sure, it’s made for a 16-hour workday, but I actually feel more energized and calmer. More at peace. Teaching, at least at the college level, is much different than anything else I do. I genuinely love the material, and with very few exceptions (maybe I’ve just been lucky so far) all of my students respond to that enthusiasm and engage in the class. And there’s the lingering sense that you’re making a difference in a very visceral way. Sure, things you do at work change the way things work, affect the course of companies and employees, and maybe it even reaches farther than that. But with teaching, the effect is immediate. You know you’re affecting lives. You can see it. In class, something you say has at least the possibility of sparking a lifelong interest or changing (via degree/major/etc.,) the course of a person’s life. -Inspiring the next generation. Well, I think that’s it. While I’m not ready to leave my fieldwork and industry work behind just yet, I love teaching. -I think it’s a feeling that will only grow with time.